Watermelon (Citrullus lanatus): growing, planting, caring. A great pleasure in the summer is to bite onto one of those when it’s hot and you feel thirsty. Citrullus lanatus - the watermelon - is a plant species in the family Cucurbitaceae, a vine-like flowering plant originally from Africa. It is cultivated for its fruit. The watermelon is an annual that has a prostrate or climbing habit. Stems are up to 3 m long and new growth has yellow or brown hairs. Leaves are 60 to 200 mm long and 40 to 150 mm wide. These usually have three lobes which are themselves lobed or doubly lobed. Plants have both male and female flowers on long hairy stalks. The watermelon is an annual plant with creeping stems that can reach ... Three meters long! The leaves, usually triangular in shape, are very indented, with rounded lobes, deeply incised but with sinuses also rounded. Some leaves are turned into tendrils allowing the plant to cling and climb on various supports. The flowers, with pale yellow corolla are, as on most Cucurbitaceous, either male or female, but all are present on the same individual (monoecious plant). The fruits are particular berries, peponides, of spherical shape, more or less oblong, of dark green color often marbled with white. Some varieties can produce fruits of around 35 kg! Inside: Sow under cover under filtered light, between 12 and 15 ° C. Sow three seeds per cup, burying them lightly in a special compost for potting. Water once a week. Outside: Sowing in open ground is only practiced in very hot and sunny regions. Sow three seeds per hole, in the garden, in full sun. Allow at least one meter between locations. Water copiously. When the plant has between 3 and 5 leaves, "pinch" - it means cut! - the end of the stem so that it divides. When the new branches have 3 to 5 leaves, repeat the process. Once the watermelons appear, pinch the stems above the first fruit, after one or two leaves. Transplant in rich, well-drained soil in full sun after the last freezes. Space the plants 0.8 to 1 m apart. Water after planting. You may enrich the soil with potassium, which melons love, by adding a little wood ash to the base of the plant. However, fertilizing the soil before planting is ideal. Harvest when your watermelons are well developed, about 60 days after planting. Weight is an index of maturity, so they must be heavy. They must sound hollow when struck lightly. On the plant, they must be picked as soon as the spin opposite to the peduncle is completely dry: it is the infallible sign of ripeness. 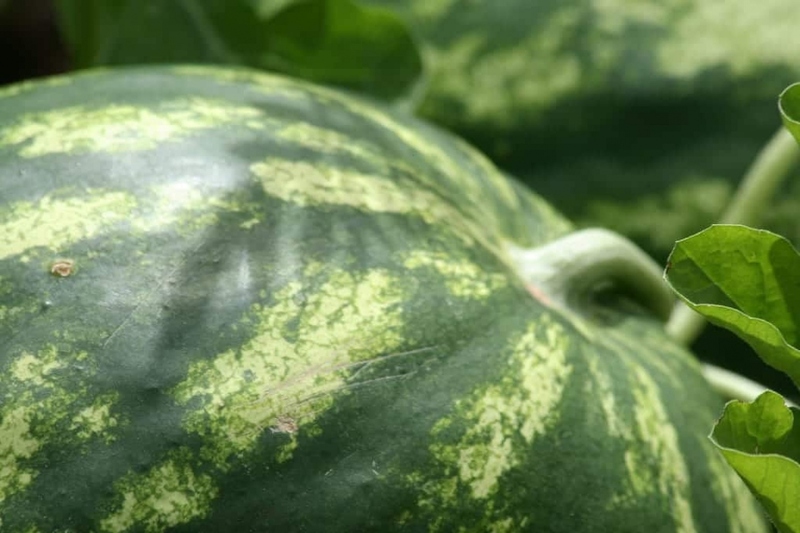 Pull up the watermelon plants after harvesting, and use the remains as compost. There are three watering periods: watering the seedlings, watering after transplanting, and watering in case of drought. After sowing, water at least once a week, without flooding the pot. Water twice a week, after transplanting if it does not rain. Finally, watch for drought during fruit formation in the summer. In any case, do not wet the leaves. Mulch the base of your watermelons after transplanting, this will limit watering and avoid the rotting of the fruits.